(update) Before the advent of Dr. Jonas Salk's polio vaccine in the 1950s, polio (infantile paralysis) was a real fear every summer, prompting President Franklin Roosevelt to launch the National Foundation for Infantile Paralysis and its fundraiser, the March of Dimes. In the years before the polio vaccine was discovered, infantile paralysis (also known as polio) was a scary thing. However, there had never been a major polio epidemic--until 1880 when major outbreaks started in Europe, quickly moving to the United States. There were frequent epidemics, usually in the cities in the summer into the 1950s until Dr. Jonas Salk's vaccine became available. In 1953, polio was still an epidemic. To combat the disease, the National Foundation for Infantile Paralysis produced several radio shows to promote the March of Dimes fundraiser. The shows featured a series about the discovery of the polio vaccine called "Man Against the Crippler". The syndicated show appeared in the summer of 1953 during the fundraising campaign. In addition to "Man Against the Crippler", several concerts were also broadcast in support of the campaign. The National Foundation for Infantile Paralysis was founded by President Franklin D. Roosevelt who had polio and was crippled from the disease though he worked hard to hide it. (In recent years, there is some evidence that the President's polio diagnosis was incorrect.) 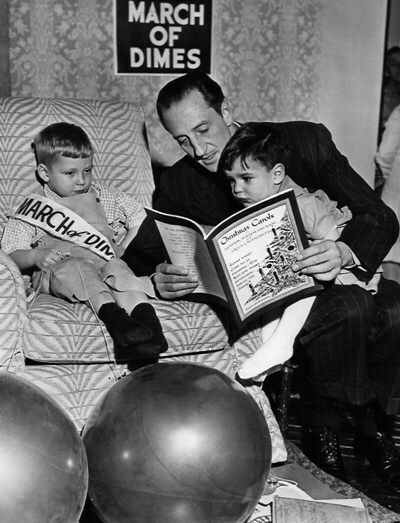 During the first fundraising effort, the President, asked everyone to give a dime to fight polio giving the fundraiser its name--March of Dimes. Be the first to comment on "March of Dimes Recordings"